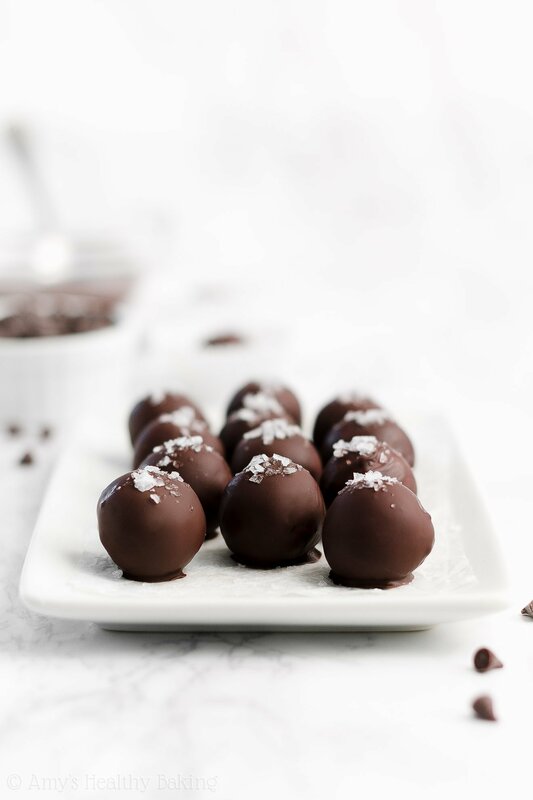 Learn how to make these healthy chocolate chip cookie dough truffles from scratch! They’re only 31 calories with no added sugar! 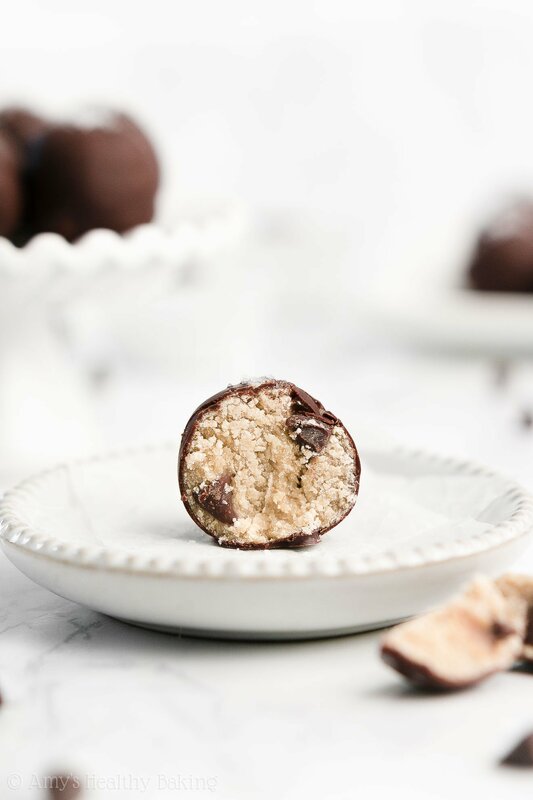 With their sweet flourless and eggless cookie dough centers paired with the rich dark chocolate coating, they taste just as indulgent as ones you’d buy from a fancy chocolate shop! Nearly every year, my parents host Christmas at their house. As part of the holiday preparations throughout my childhood and most of college, my brother and I helped put up and decorate their artificial tree with strands of rainbow colored lights and our massive collection of ornaments, always with festive carols playing through the stereo in the background. On Christmas morning, we all stumbled out to the family room before the sun rose to gather around the tree and open presents. As my brother and I grew older and started sleeping in past 6 am, we pushed back the time by an hour or two (or more!) to let everyone get enough rest, but we always began with the stockings carefully laid out on the fireplace. A small box of chocolate truffles! After unwrapping the container and peeking inside, we found three decadent truffles, each a different flavor, varying from purely dark chocolate or peppermint to buttery caramel or chocolate chip cookie dough. I nearly forgot about opening presents… I was so excited to sample each one! By the end of the day, nearly everyone’s truffles (not just mine!) had completely disappeared without even a teensy morsel of chocolate left behind on the wrappers. Although they all tasted deliciously sweet and chocolaty, the chocolate chip cookie dough ones were almost everyone’s favorite. 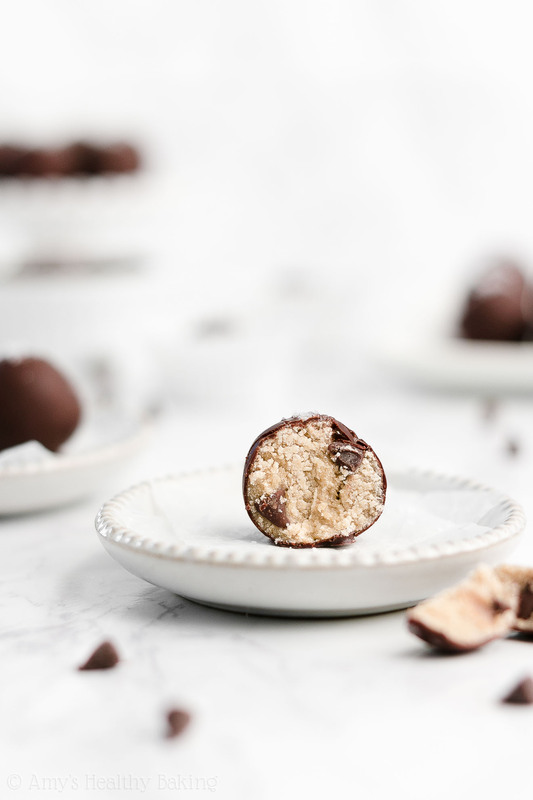 And now, way too many years later, I finally made a healthier version of them with these Healthy Chocolate Chip Cookie Dough Truffles! With a soft flourless and eggless cookie dough center and a coating of rich dark chocolate, these taste even more decadent than the ones in our stockings that Christmas. And unlike those originals, these healthy truffles contain no artificial ingredients or added sugar (just lots of indulgent chocolate flavor! ), and they’re just 31 calories! 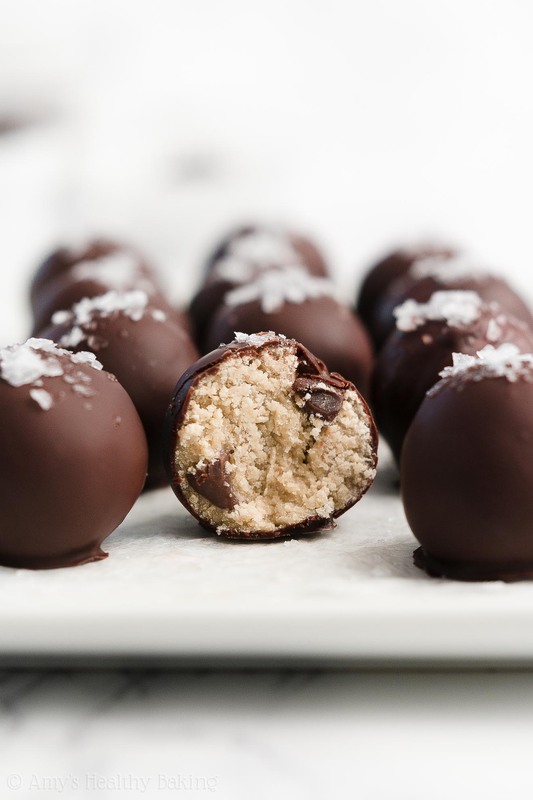 So let’s go over how to make these healthy chocolate chip cookie dough truffles! You’ll start by making the cookie dough centers, and to make things as easy as possible, you just need one bowl to do that! 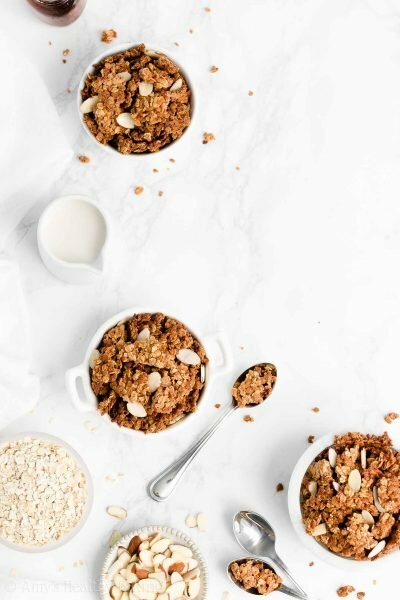 As the first ingredients in that bowl, you’ll add a teensy tiny bit of melted butter, vanilla extract, and liquid stevia. Whereas many cookie dough recipes call for ½ cup or more of butter, this healthy one only requires 1 teaspoon. That really helps keep your healthy chocolate chip cookie dough truffles low fat and low calorie! 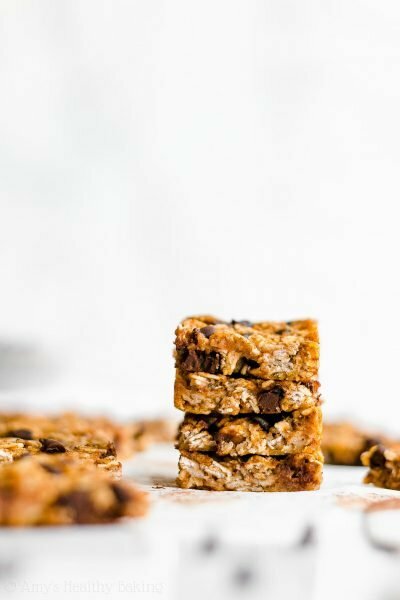 Also unlike traditional cookie dough recipes that call for refined granulated sugar, you’ll sweeten your healthy version with liquid stevia instead. Stevia is a plant-based, no-calorie sweetener that contains nothing refined or artificial (aka it’s clean eating friendly!). It’s also highly concentrated, which is really important for this recipe! To make this healthy chocolate chip cookie dough taste just as sweet as traditional recipes, you’d need to add around ½ cup of honey or pure maple syrup. Unfortunately, that would add way too much liquid to the cookie dough, and it’d be as wet and runny as muffin batter! That would mean you definitely couldn’t roll it into balls, let alone make truffles out of it. So that’s where the liquid stevia comes in! Because it’s so concentrated, you only need ¾ teaspoon to sweeten your entire batch of healthy chocolate chip cookie dough truffles. 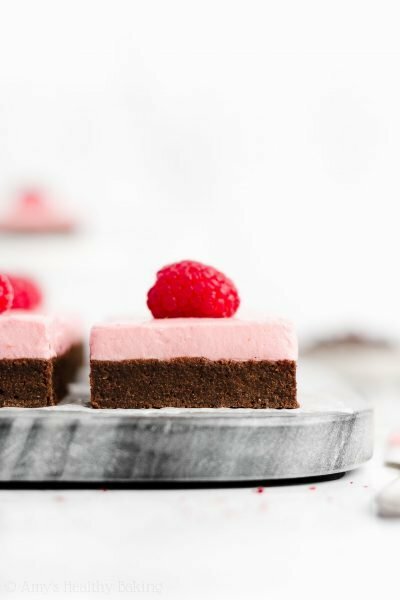 With that small volume, it makes them really sweet and the right texture! Tip: I buy my liquid stevia online here because that’s the best price I’ve found, and you’ll use it in all of these recipes of mine too! Next, you’ll skip the eggs (to make sure your cookie dough is safe to eat raw!) and replace them with unsweetened cashew milk instead. This is one of my all-time favorite milk options! It’s thicker and creamier with a consistency similar to whole milk, and it’s just 25 calories per cup. Since many of my family members are lactose intolerant, I use it (and unsweetened almond milk!) all the time in my baking recipes. I’m obsessed! After whisking in a bit of salt, you’ll stir in oat flour. 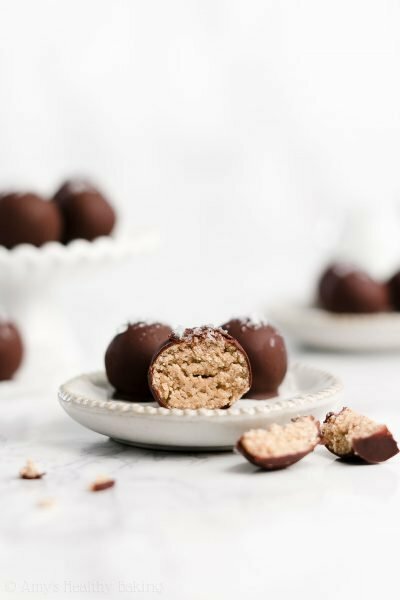 Technically, oat flour is just really finely ground oats… But “oat powder” doesn’t quite have the same right as “oat flour!” So I never know whether to call these flourless or practically flourless healthy chocolate chip cookie dough truffles… But regardless, they certainly taste delicious! Tip: I love this oat flour (or this one, for the gluten-free version!) because it’s so fine and powdery! You can also make your own at home. I show you how here! Just remember to measure your oat flour correctly, using this method or a kitchen scale. (← That’s the one I own and love!) Oat flour is much more absorbent than regular flour, so adding too much will dry out your cookie dough centers and make them hard to roll into spheres. I promise it’s worth taking the extra time to measure so your healthy chocolate chip cookie dough truffles turn out perfectly! And of course, there’s one last component in the centers of your truffles… The mini chocolate chips! It’s basically impossible to make healthy chocolate chip cookie dough truffles without them, right? Just one word of caution… You must use mini chocolate chips! Regular sized chocolate chips are too big and will make your cookie dough centers fall apart. If you only have regular sized chocolate chips, them chop them into smaller pieces before stirring them in. Also, don’t add too many mini chocolate chips—that will have the same effect as using regular sized ones, and your cookie dough centers will fall apart when you try to roll them into balls! Besides… There’s more chocolate to come (you’ll dip them in melted chocolate later! 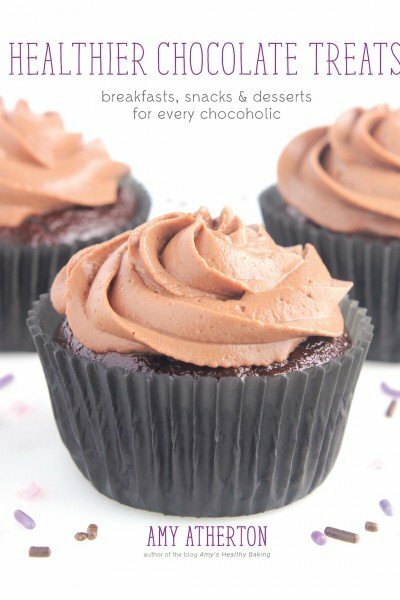 ), so you’ll still get lots of chocolate in every bite, even with the small amount of mini chocolate chips in the centers! Time to roll! Working with a small amount of the filling (these are bite-sized truffles! ), roll it into a sphere in between your palms, and place it on a large sheet of wax paper. If the cookie dough falls apart in your hands, it’s probably because there’s too much oat flour in the cookie dough. But not to worry! Just moisten your palms or fingers with a teensy bit of water, and try rolling it again. That’ll help the cookie dough stick together! Here comes the fun part… Dipping your healthy chocolate chip cookie dough into melted chocolate! I always use high quality bars of dark chocolate, like Ghirardelli or Lindt. Do not use chocolate chips! Those contain a stabilizer, which prevents them from melting as smoothly as bars of dark chocolate. I also haven’t had luck with “milkier” brands of dark chocolate, like Hershey’s special dark or Cadbury. Those are thicker and goopy-er (if that’s a word! ), whereas the ones I prefer from Ghirardelli and Lindt melt into a really thin liquid. That thin liquidy texture makes them perfect for dipping truffles! I use a panini press! I know, that sounds a bit strange… But here’s why it works! After plugging in my panini press and melting the dark chocolate in the microwave, I fold a washcloth in half and place it on the metal top of my panini press. (The one I own isn’t sold in stores anymore, but this one is similar!) Then I put my bowl of melted chocolate on top of the washcloth. This set-up keeps my melted chocolate warm and liquidy throughout the entire dipping process. 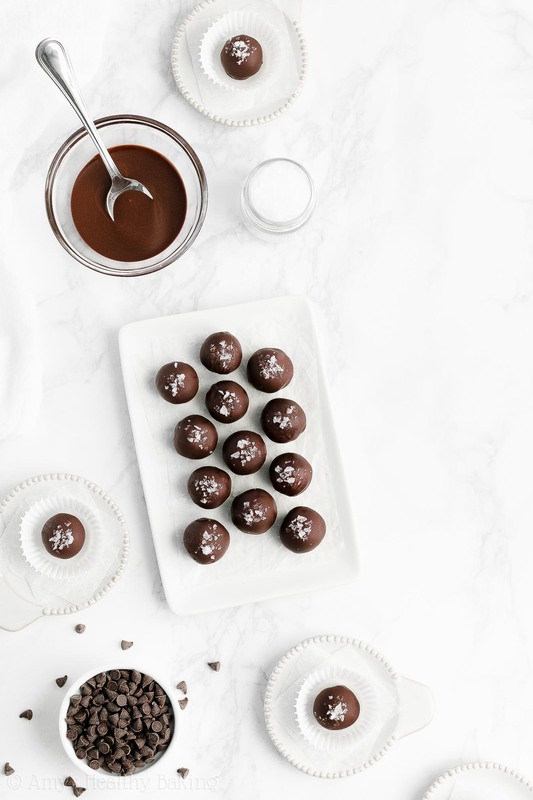 When your chocolate stays warm and liquidy, it’s easier to work with, you get a more even coating on each truffle, and your healthy chocolate chip cookie dough truffles don’t have any speckles in their coating. The coating is smooth and gorgeous, just like what you’d see at a fancy chocolate shop! Tip: An electric pancake griddle also works well, if you don’t have a panini press with a metal top like this one! 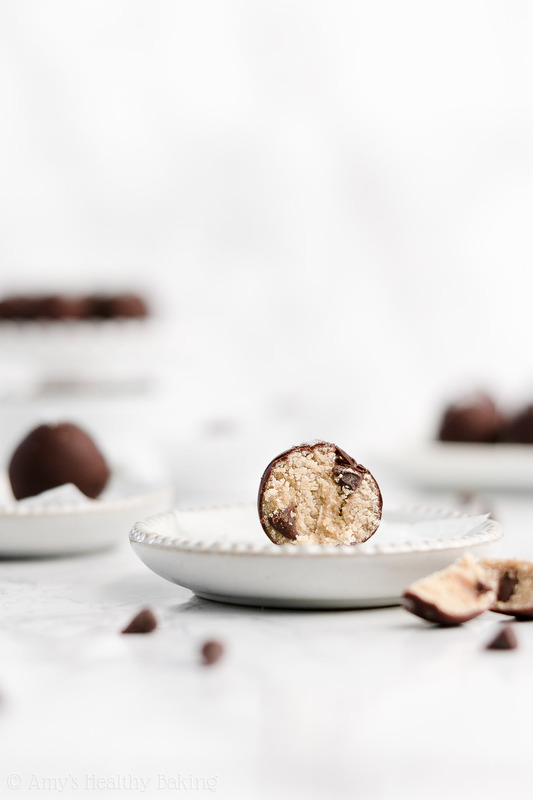 To dip each healthy chocolate chip cookie dough truffle, you’ll gently drop one filling sphere into your bowl of melted chocolate. Using two forks, roll it around until it’s completely coated. Lift it out of the melted chocolate with one fork, and rock it back and forth between the tines of your two forks to let the excess melted chocolate drip off. Place your fully dipped truffle back onto your sheet of wax paper. And for a fancy finishing touch, I added a sprinkle of this flaky sea salt onto the tops of my healthy chocolate chip cookie dough truffles! I found that it was best to let the melted chocolate start to set for a minute or two before sprinkling the salt. 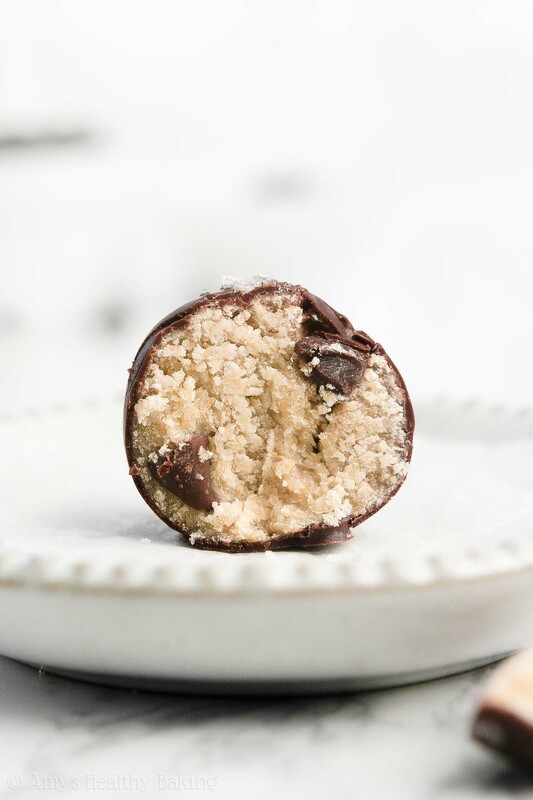 But that bright pop of salt really brought out the rich flavors of the chocolate and sweetness of the filling—and made these homemade healthy chocolate chip cookie dough truffles taste just like they came from a gourmet chocolate shop! Although I may be biased, I definitely think these taste a billion times better than the ones we found in our Christmas stockings! 😉 And when you make your own, remember to snap a picture and share it on Instagram using #amyshealthybaking and tagging @amyshealthybaking IN the photo itself! (That guarantees I’ll see your picture! 😊) I’d love to see your healthy chocolate chip cookie dough truffles! 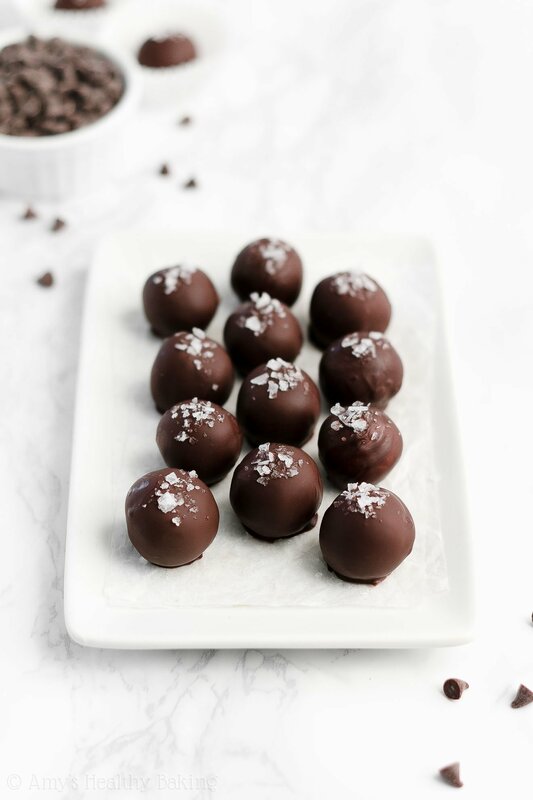 These homemade truffles taste just like the ones you’d find in a fancy chocolate shop! They have sweet, soft cookie dough centers and a coating of decadent dark chocolate. Although optional, I highly recommend sprinkling a little flaky sea salt on top. It really brings out both the sweetness and richness of these truffles! Leftovers will keep for at least 4 days (if not longer!) if stored in an airtight container in the refrigerator. Place a sheet of wax paper or parchment paper on a baking tray. In a medium bowl, stir together the butter, vanilla extract, and liquid stevia. Stir in the cashew milk and salt. Add in the oat flour, stirring until just incorporated. Gently fold in the chocolate chips. Working with a small amount of the mixture at a time, roll into a bite-sized sphere. Place on the prepared baking sheet. Repeat with the remaining mixture. Working with one cookie dough sphere at a time, carefully dip it in the melted chocolate using two forks, and let the excess drip off by rocking it between the two forks. Place back onto the wax paper. 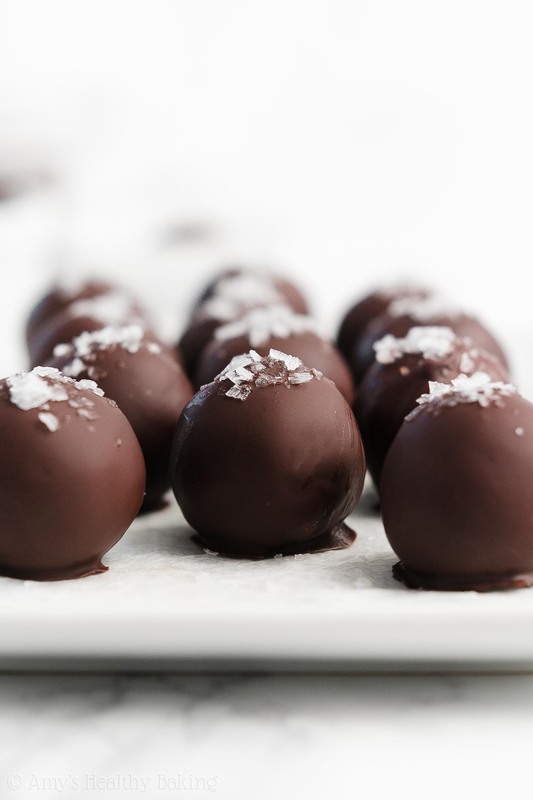 If using the flaky sea salt, sprinkle a small amount on the top of the dipped truffle. Repeat with the remaining chocolate and cookie dough spheres. 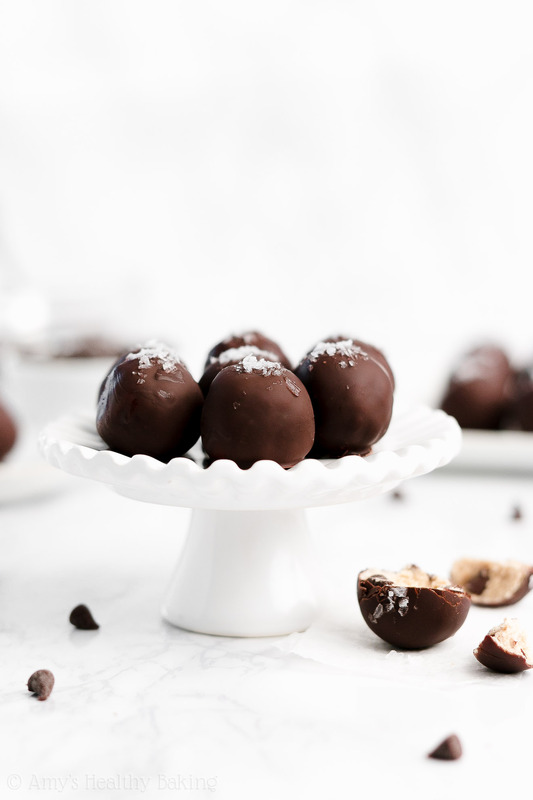 Once all 24 truffles have been coated, place them in the freezer for 5-10 minutes (or the refrigerator for 15-20 minutes) or until the chocolate has hardened. Store in the refrigerator until ready to eat. Notes: Any milk can be substituted for the unsweetened cashew milk. Make sure your milk is at room temperature! Cold milk will re-solidify your butter or coconut oil. If you'd like to make your own oat flour, I show you how here! Any flour except coconut flour may be substituted for the oat flour. When substituting gluten-free flours, the texture of the cookie dough bites will vary (and typically be grainier). I highly recommend using the liquid stevia! It’s one of my favorite ingredients, and you’ll use it in all of these recipes of mine, too! I buy mine online here because that’s the cheapest price I’ve found. For sweeter bites, increase the liquidy stevia by an additional ⅛ to ¼ teaspoon. You must use miniature chocolate chips! Regular sized chocolate chips are too big, and they’ll make the cookie dough centers fall apart when you try to roll them into spheres. If you only have regular sized chocolate chips, then chop them first. Also, do not add more miniature chocolate chips! Too many will also cause the cookie dough to fall apart when to try to roll it into spheres. 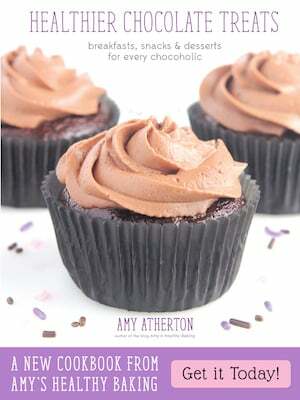 ♡ …and the rest of Amy’s healthy candy recipes! What can I use in place of Stevia ? I really appreciate your interest in my recipe Anna! I’ve actually covered this in the Notes section (located directly underneath the Instructions). I know it can be easy to miss! 🙂 I’d love to hear what you think if you try making these truffles! Stevia is really concentrated. How much sugar or maple syrup is the equivalent to 3/4 tsp stevia? I really appreciate your interest in my recipe Janice! I’ve actually covered what to do if you don’t want to use stevia in the Notes section of the recipe, located directly underneath the Instructions. I know it can be easy to miss that section! (Every stevia brand and product is slightly different, but the amount of the one that I use and link to in this recipe is the equivalent of 6 tablespoons of maple syrup. I don’t recommend substituting that much though — see the Notes section and my blog post above for more information!) 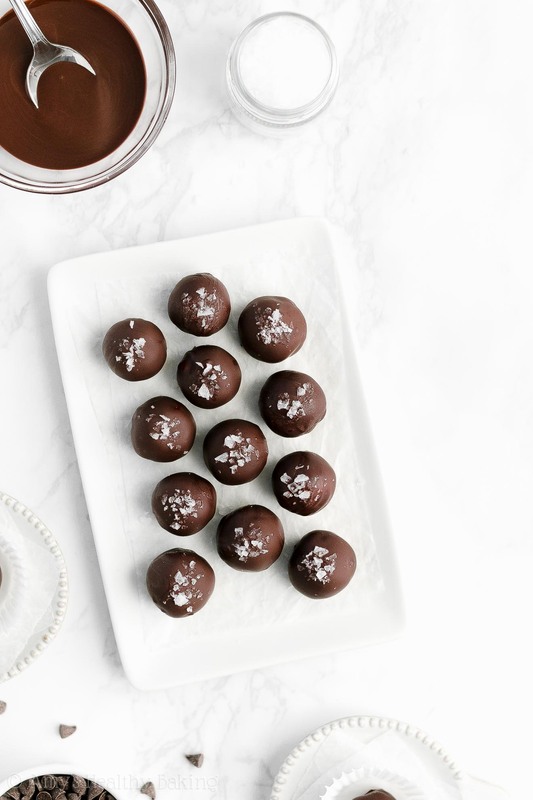 🙂 I’d love to hear what you think if you try making these truffles!